The oldest, clear mention of a church on this site dates back to 1047. Duke Lambert II then had a new Roman church built at the Molenberg in honor of Saint Michael, the archangel who is also the patron saint of Brussels. 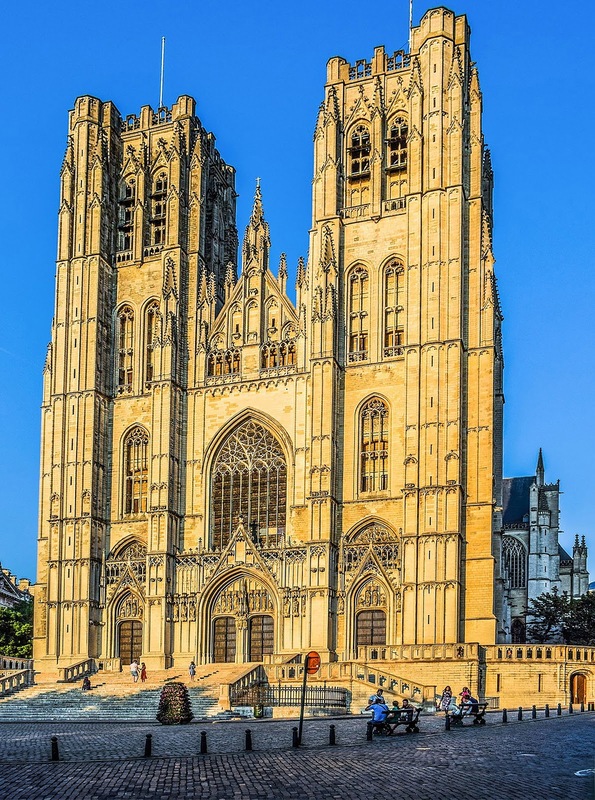 On November 16, 1047, the day on which the Romanesque church became consecrated, the Duke had the relics of the St. Gudula church transfert to the new church. Since then, the church was officially called 'the collegiate of the saints Michael and Gudula'. 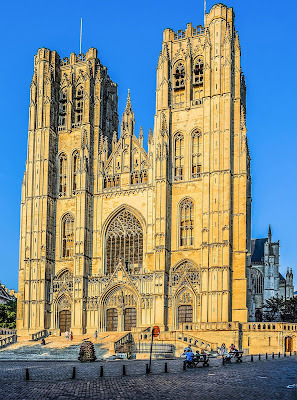 But most people called it 'the Saint Gudula church'. Strangely enough, the cathedral was officially called 'St. Michael's Church'. The replacement of the Romanesque church with a Gothic building took several centuries. They started around 1220 with the choir aisle and the radiant chapels, to finish with the construction of the two western towers. The southern tower was finished in 1451, the northern one in 1475. Later the choir aisle and blasting chapels were broken down again to make room for the northern ones. The Holy Sacrament Chapel was built in 1539 and the Southern Our Lady's Chapel between 1651 and 1656. The chapel in the apse was replaced between 1672 and 1675 by a baroque construction. A whole bunch of architects worked on this long building history. In the 14th century Jacob van Thienen, Jan van Ruysbroek and Gilles de Briedere were the main architects. Later rebuilds were more restorative. In 1860 the monumental staircase was added. The northern portal dates from 1881-1886 and was designed by Louis de Curte. 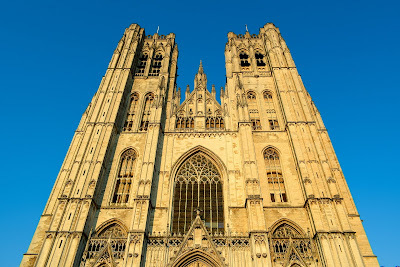 In February 1962 the church got the rank of cathedral and since then she has been the headquarters of the archbishop of Mechelen-Brussels, together with St-Rombouts Cathedral in Mechelen. You can find the Cathedral of St. Michael and St. Gudula at this address: Sint-Goedelevoorplein, Brussels.